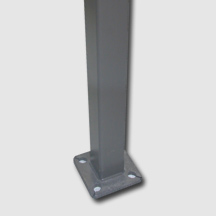 The pole shaft is fabricated from hot rolled carbon steel having a minimum yield of 55,000 PSI and conforms to ASTM A500 grade C requirements. The shaft construction is two pieces of formed steel welded longitudinally connect by an internal hinge. The hand hole is located 1’ 6" above the pole base. A ground lug is provided standard. Winch ordered separately.